Whitsunday Mountain Bike Club members have tackled the six-hour Mad Rush in Mackay over the weekend. The race saw riders tasked to complete as many laps of the 6.5km course as possible within the dix-hour time frame. The course proved a challenging single-track with multiple A and B line options. Husband and wife duo Michael and Sam Sorley took out the mixed pairs category, clocking an impressive 14 laps. Scott White, lining up for his first mountain bike race, came away with a respectable 11. In the solo women’s, Chris Labes recorded 12 laps while Leigh Smith (six) and Anne-Marie was forced to retire after three hours due to a mechanical issue. Posted on August 28, 2014, in Uncategorized. Bookmark the permalink. 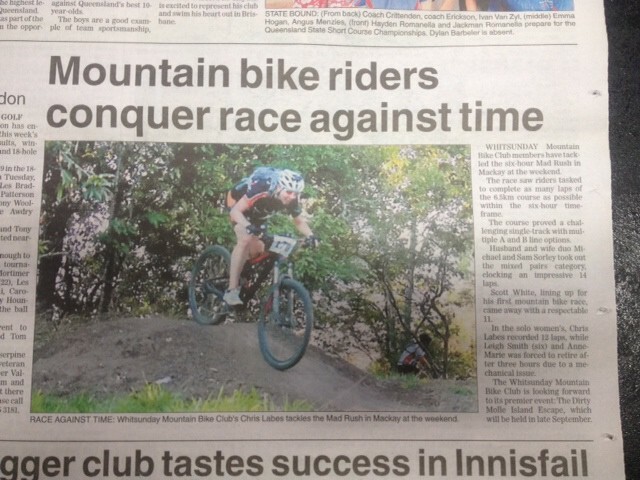 Comments Off on Mountain bike riders conquer race against time.